Using acupuncture needles on specific points on the face to enhance beauty and preserve a youthful appearance has been done for centuries in China and other Asian countries, but it's just started to become popular in the United States in the past decade or so, practitioners say. The positive side effect of facial acupuncture is that since some acupoints on the face correspond with many internal organ functions, a facial acupuncture session may lead to an increased inner balance as well. 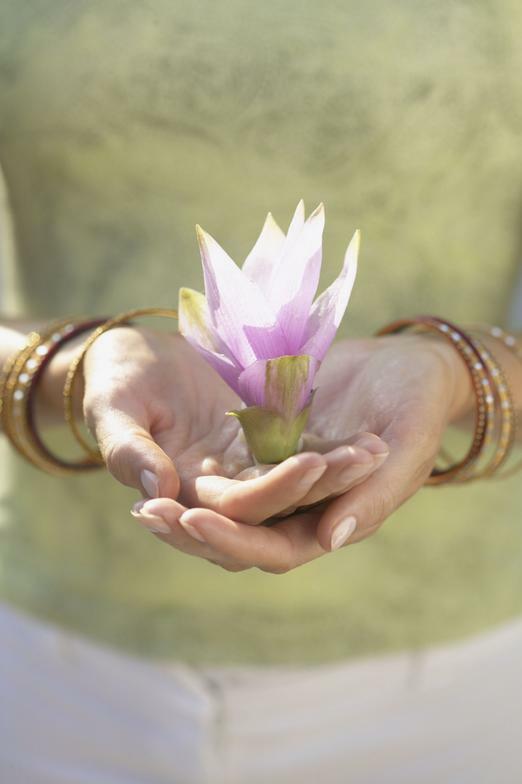 Inner harmony and outer beauty often go hand in hand. The non-surgical Mei Zen cosmetic acupuncture procedure is the beauty secret used by the Asian nobility for thousands of years. 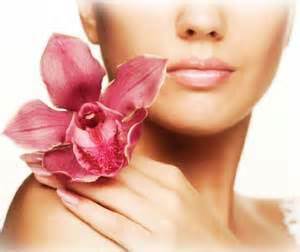 It is a holistic, natural and comprehensive skin rejuvenation program designed to restore, rejuvenate and relax. 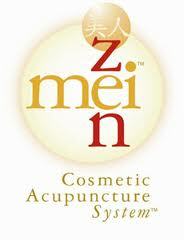 Drawn from the ancient texts of Chinese medicine, the Mei Zen cosmetic acupuncture is a natural technique. Small, less than hair-width acupuncture needles are placed in a precise configuration just under the skin's surface to stimulate the production of collagen and elastin. Promotes blood and lymph circulation: increased circulation dilates peripheral blood vessels for better distribution of oxygen and nutrients as well as cellular regeneration. Rehydrates the skin's external layers: through stimulation of the secretion of the sweat and sebaceous glands which encourages the regeneration of healthy skin cells. Helps exfoliation: aids the proliferation of new skin cells, increases nutrition to the skin's surface, improves the quality of the skin and promotes a health aids the proliferation of new skin cells, increases nutrition to the skin's surface, improves the quality of the skin and promotes a healthy glow.y glow. aids the proliferation of new skin cells, increases nutrition to the skin's surface, improves the quality of the skin and promotes a healthy glow. aids the proliferation of new skin cells, increases nutrition to the skin's surface, improves the quality of the skin and promotes a healthy glow. aids the proliferation of new skin cells, increases nutrition to the skin's surface, improves the quality of the skin and promotes a healthy glow. Allows healthy "breathing" of the skin: increasing the skin's protective ability to ward off infections and clogged pores. Stimulates the production of elastin and 4 collagen proteins in the skin to firm, reduce and soften wrinkles. Reduces and relaxes the tension in the nerves and muscles:improving the integrity of the skin resulting in improved overall facial appearance. How successful is cosmetic acupuncture? A study published in the International Journal of Clinical Acupuncture showed that of 300 people who received facial acupuncture, 90% saw marked results after one course of treatment. 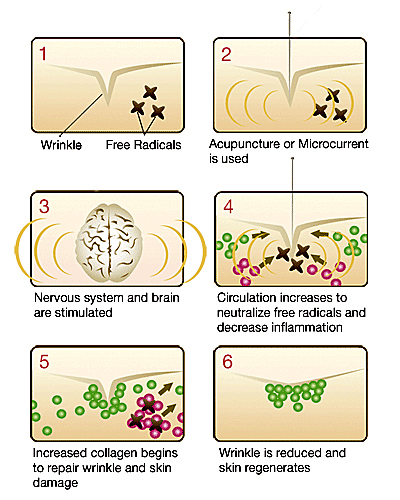 The acupuncturist Flora Najafi explains: "Fine wrinkles can disappear and deeper ones may 'level' out. Your basic facial ‘personality’ remains - except that you're happier and more vibrant looking. You retain the character in your face since the structure of your face isn't changed with Cosmetic Acupuncture." Mei Zen will make an ideal birthday and mother’s day gift. Gift certificates are also available. Micro-current has been shown to be effective when used to assist with cellular healing and regeneration. Studies show that Micro-current stimulates the body’s own natural rejuvenating powers which are lost as we age. Over time, collagen and elastin weaken leading to the physical signs of age such as fine lines and wrinkles, skin tone discoloration, uneven skin texture. When facial muscles lose their youthful tone and skin begins to fall and sag as a result. This is akin to a battery losing its charge. Micro-current helps the body recharge itself into a more youthful electric state. Microcurrent has been very effective for this condition, especially when treatment is started in the early stages of the condition. Microcurrent facial rejuvenation, which is mainly used for aesthetic purposes, can help reverse Bell’s Palsy. Micro-current emits subtle electrical frequencies that mimic the body’s own electrical signals (it is therefore physiologic and safe. ), thereby increasing the amount of ATP (adenosine tri-phosphate, the chemical fuel of human cells) by as much as 500%. Such increased levels of ATP speed cellular metabolism; the result is a detoxification that increases the rate of waste and impurity elimination. Protein synthesis and cellular membrane transport are also increased, as well as the reconstitution of collagen and elastin. With each treatment, ATP levels are stockpiled or stored, which is why Micro-current Facial Treatment results are cumulative and become better as a series of treatments progresses. Micro-current is sub sensory and is usually not felt while it is being delivered, since there is barely enough current to stimulate the sensory receptors. Are there any side effects or down time after Micro-current Treatment? No, there is no side effect reported by Micro-current treatments. Unlike laser, Micro-current do not rely on thermal energy sources; as result, there is no inflammation or redness, no downtime or recovery time involved. You can reapply make-up and go on your day right after treatment. Everyone can benefit from this remarkable non-surgical technology. You will see noticeable improvements with Micro-current. As we mentioned earlier above, Micro-current treatment is a cumulative procedure; major changes will be more lasting as your memorable facial strength is achieved with continues treatments. Visible improvements are noticeable with only one treatment; however, such results may only last 48-72 (Individual case may vary) hours in the initial treatment, then 3-4 days as you reach your 4 or 5 treatment. By the 6 or 8 treatment, muscle memory takes over and progress becomes more rapid and longer lasting, until only a booster treatment is needed every 6-8 weeks to maintain the results. This is called “muscle re education”. We recommend our users to perform Micro-current treatment 2 times per week for the first 5 weeks; follow by only a booster treatment is needed every 2 months to maintain the results. Is Micro-current treatment recognizable in the beauty industry? Micro-current has been reported to be one of the hottest available in the market. In fact, industry expects predicted Micro-current treatment to be as popular as Botox and Microdermabrasion. Hollywood has chosen Micro-current treatment for celebrities in the weeks before the Academy Awards. (Micro-current was featured on an episode of “Pre-Oscar Makeovers”). By using 2 probes with cotton tips through which emits a very gentle micro-current pulses that promotes collagen and elastin production in your skin As the cotton tipped probes glide over very specific acupuncture points and muscles on your face, circulation is stimulated. The treatment is performed in a very individualized and specific sequence depending on your face and needs. The buildup in ATP explains the lasting effects of micro-current on re-educating the facial muscles to tighten and tone. If you’re wishing to turn back the clock a bit but aren't interested in undergoing surgery, this treatment is for you!